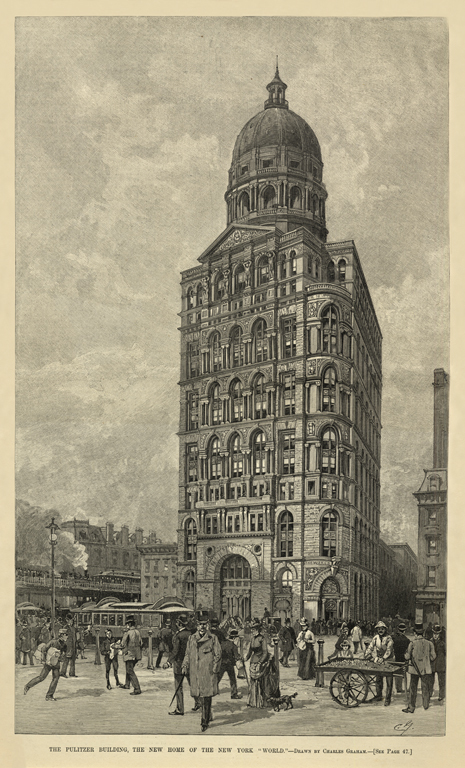 Drawing of the World Building, Harper's Weekly, January 18, 1890. Pulitzer, a Hungarian immigrant who had first arrived in New York in 1864 and fought in the Civil War, had his initial success the newspaper business in St. Louis. He purchased the New York World from financier Jay Gould in 1883 when the ailing paper had a daily circulation of only 22,000. A year later, Pulitzer had quadrupled the circulation, and by 1898 was selling a half million copies a day. "From Jersey's shores, from Brooklyn Heights, from the beach of Staten Island, from points far remote, it is first discerned as one approaches New York looming above the busy metropolis, above Trinity's lofty spire, above the tall towers and high roofs of its neighbors-a giant among the giants." In an architectural competition, Pulitzer selected George B. Post, architect of the Times Building, to design his tower. Some stories claim that Post won the commission by wagering $20,000 with Pulitzer that he could complete the project for its $1,000,000 budget. He got the job, but lost the bet, since the costs reached $2,000,000. No expense was spared on the elaborate fa�ade of red sandstone, Renaissance ornament, and figurative sculpture that gave the tower an Old World character and made it look to be made of masonry rather than the advanced metal-cage construction that Post used within the walls. "There is a sermon in these stones: a significant moral in this architectural glory. Fidelity to the Public Welfare, fearless opposition to the Wrong and vigorous defence (sic) of the Right, a persistent aspiring to loftier Ideals are the lessons it teaches."